Many people tend to underestimate the importance of a good pair of work boots. Work boots are a whole lot more than a pile of fabric that you strap to your feet for a long day of work. They aren’t just there to cover you up, and they certainly are not there to look pretty either. Although, a good pair of work boots can certainly look stylish, but that is certainly not the main function of them. The fact of the matter is that finding the right pair of work boots is much more important than you might think at first. It really does not matter whether you are a clerk, a mechanic, carpenter, software engineer, or anything in between. Each and every occupation out there has specific risks that you need to be prepared for, and often it is your feet that are at the greatest risk. Whether your feet are at risk of tiring out fast, at risk from falling debris, from nails on the ground, or even live wires, a good pair of work boots can make all of the difference. Sure, heavy occupations like construction and demolition definitely require good foot protection, but this is also true for other occupations where there are no inherent physical dangers. Being on your feet all day long without the proper footwear can cause foot pain, leg issues, back pains, and even misaligned spines too. What Is A Steel Toe Cap? In case you are wondering what a steel toe cap is, let us help you out and give you a little rundown right now. In layman’s terms a steel toe cap is more or less just a layer of steel that is put over the toes on certain work boots, steel toe boots, as they are sometimes called. This protective layer, the cap, is usually made out of steel, but some boots feature plastic, rubber, and aluminum as well. Steel is by far the best option to go with because it can actually bend a bit under pressure. Other materials may block some impact, but too much impact will actually break them, shattering them to pieces and rendering your feet unprotected. With that being said, if you are working on a site with lots of wires and electrical work going on, you might want to avoid conductive materials as you probably don’t want to get fried. It really depends on the type, price, and quality of work boots that you get. The whole point of steel toe caps is to protect your feet from being crushed by all manners of falling objects. It is a solid layer of metal that keeps your toes and feet from being crushed. To take things one step further, some work boots even come with steel soles, or in other words, a layer of steel along the whole footbed. This is really essential when it comes to construction sites with lots of sharp objects laying around. You are way better off with a steel toe and steel soled boot on a jobsite than without. You don’t want nails penetrating your feet and you don’t want bricks crushing them either. Keen Utility is quite a reputable, well-known, and highly trusted brand name in the world of construction footwear. 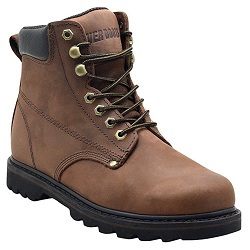 This is a brand that is known for producing high quality products, especially steel toe work boots like this KEEN Utility Men’s Pittsburgh Steel Toe Work Boot. When you are on the jobsite and need good protection for your feet, as well as a high level of comfort, this is a boot that you might want to take a serious look at. While it is not exactly the most beautiful look work boot, it certainly gets the job done without question. However, the fact that these things are made of real leather is a big bonus when it comes to durability. For one, the KEEN Utility Men’s Pittsburgh Steel Toe Work Boot comes with an awesome steel toe cap in the front. It is hard, it is durable, and a little flexible too. It should do a great job at protecting your toes from pretty much any type of impact that might happen on a jobsite. What is cool here is that these boots feature asymmetrical protection to protect both the left and right foot as needed. The oil and slip resistant outsoles are pretty neat too. Most work boots do not have the ability maintain superior traction when standing on oil, but these most certainly do. The support provided for feet here is pretty top notch too. 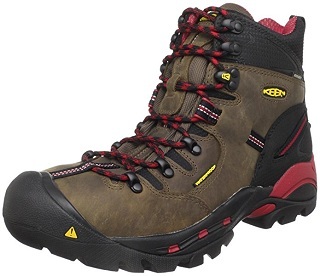 The KEEN Utility Men’s Pittsburgh Steel Toe Work Boot features a hiking boot style fit, which means that you get a lot of support from all directions. For one, the metatomical foot bed is anatomically designed to support your arches, to provide a soft walking surface, and to absorb bottom-up impact as well. The foot bed is actually removable, but you should probably leave it in. You might like the Dry-Lex lining included here, because it helps to wick away moisture so your feet don’t get too hot and sweaty from a long day’s work. Who doesn’t like a good looking work boot that also happens to be comfortable and offer a lot of protection? 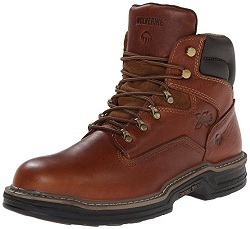 We certainly like the sound of that, which is why we are big fans of the Wolverine Men’s W02421 Raider Boot. For one, this boot is made out of real leather, something that we like quite a bit. Leather is strong, it is durable, and waterproof too. The Wolverine Men’s W02421 Raider Boot will last for a long time to come thanks to the leather build. At the same time, they do also feature mesh in some places. This is nice because it helps to increase breathability and ventilation quite a bit. Your feet should not get too hot or too sweaty in these particular boots. There is also the fact that these boots actually look quite nice, which is always a bonus. Heck, you could wear these things to a party if you are in a tight spot. Of course, these are steel toe boots and they feature a nice chunk of steel to protect the toes and the front of the foot. Even though the toe is hard as a rock and more than able to withstand high impacts, the Wolverine Men’s W02421 Raider Boot itself is actually quite flexible and athletic to wear. These things are meant to be both comfortable and protective, which is probably what you are looking for. The ContourWelt and Multishox construction of this boot makes it super flexible, it forms to your foot, and it offers quite a bit of support from all sides. While these things might be fairly heavy, at least they are fairly flexible too. The insole in the Wolverine Men’s W02421 Raider Boot is fairly comfortable. It is designed for multiple purposes including shock absorption, providing a soft walking platform, and for keeping your arches well supported too. Finally, these boots have pretty good traction as well. They are made to stop you from slipping and falling on wet and oily surfaces, which is pretty important when it comes to construction sites. When it comes to work boots, clothing, tools, and big old construction equipment, you will be hard pressed to find a better, more reliable, and higher quality brand name than Caterpillar. 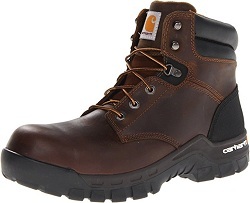 These guys know what they are doing and it shows with this great Caterpillar Men’s 2nd Shift 6″ Steel Toe Boot. When it comes to durability, you won’t find much better than this boot. The real leather build renders it really rugged, plus it is also waterproof, which is good for those rainy days. On a side note, the black leather used here actually looks really nice too. Now, the Caterpillar Men’s 2nd Shift 6″ Steel Toe Boot is not quite as comfortable to wear all day long as some other work boots. However, while it sacrifices some comfort, it is extremely rugged, durable, and offers awesome protection too. It does feature an ok midsole for decent arch support and a soft walking surface, but maybe not quite as good as with some of the other work boots we have looked at so far. With that being said, the Caterpillar Men’s 2nd Shift 6″ Steel Toe Boot does come with a Climasphere sock liner. This is really cool because it helps to keep your feet cool, plus it helps wick away moisture too. Another big benefit that you get with the Caterpillar Men’s 2nd Shift 6″ Steel Toe Boot is that it comes with a rubber slip resistant outer sole. The traction here is so good that even oil should not be a big problem when it comes to walking around on the jobsite. This is a steel toe boot, so it does come with a nice steel toe cap in the front, one that is proven to protect toes and the front of your feet from some pretty severe impacts. All in all, although these are not the most comfortable work boots in the world, the Caterpillar Men’s 2nd Shift 6″ Steel Toe Boot will definitely last for years to come and offer solid protection for your feet. When it comes to look, durability, comfort, and overall protection, you need the right boot on the jobsite. Well, the Skechers Men’s Verdict Men’s Boot comes with all of those features and a little more too. While they are not exactly our number one choice, they certainly do get the job done without question. Heck, these things are actually quite inexpensive, which is a big bonus that many people will probably appreciate. These particular work boots are ankle boots, which some people may like and others may not. While ankle height boots do not have as much ankle support as higher boots, they will help keep you cooler. We personally find ankle boots to be more comfortable than full height boots, but ankle support is quite important on a jobsite. Speaking of comfort, the Skechers Men’s Verdict Men’s Boot does come with a lightly padded insole. No, it is not as well-padded as some of the other options we have looked at, but it is still better than many other work boots out there. It does a decent job at supporting the arches, absorbing bottom-up impact, and providing a decently soft walking surface. They do come with a padded tongue and collar which is a bit of a bonus. 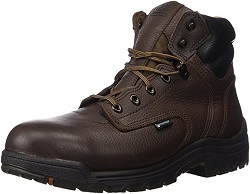 In terms of protection, just like the other work boots we have looked at, the Skechers Men’s Verdict Men’s Boot comes with a good steel toe cap in the front. It is more than strong enough, and flexible enough, to protect against most impacts. To make sure that you don’t slip and fall, these boots come with a fairly deep tread, a good tread pattern, and the material is slip resistant even to oil. When you go to work, you need a good pair of boots. There is no doubt about that. However, we are not talking about office shoes or sports shoes here. We mean real boots for real working men and women. Now, steel toe boots are good and all. They certainly help protect feet from damage, but that is not what we are here for today. Steel toe work boots are fine, but in many cases they can be a bit unnecessary. Sometimes, soft toe work boots do the trick just fine. Let’s talk about what exactly soft toe work boots are, what they are meant for, and more. We also want to review 4 of the best soft toe work boots out there at this time, so let’s get right to it. What is a Soft Toe Boot? Ok, so you probably know what a steel toe boot is, and if not, let us explain. A steel toe boot, or a steel toe cap boot, is a type of work boot that features a metal plate over the toes. The plate is most often made of steel, but sometimes rubber, other metals, or composite materials are used. The point of the steel toe cap is to protect your toes and the front part of your feet from being crushed by worksite debris. They are great for constructions sites and other such work places. So, the soft toe boot is pretty much the exact opposite of the steel toe boot. Soft toe boots are still meant to be work boots, but they don’t have the added protection of the steel toe boot. They do not have that steel cap over the toes to protect from damage. Now, they are not the best option to go with for workplaces with tons of debris like rocks, bricks, cement chunks, and wood flying around. However, soft toe work boots are great options to go with in many other circumstances. You see, steel toe boots do offer a lot of protection, but they are also really heavy and bulky. In many cases, you just don’t need that extra weight and added protection from the steel toe. It is not always necessary. Carpenters, plumbers, electricians, mechanics, and other such professionals are manual laborers per say, but they don’t really need those heavy and bulky steel toe cap boots. For them, soft toe work boots are just fine. They’re much lighter and more comfortable than the steel toe alternative. Now that we have talked about exactly what soft toe boots are and why they come in handy, let’s take a look at what we think are the 4 best soft toe boots on the market right now. For one, if you need to look like a professional, but also need durable and comfortable work boots, these Red Wing Men’s Iron Ranger Boots are a great choice to go with. They definitely look fairly nice. They have a really beautiful and professional looking brown leather finish that stands out and catches the eye. That is right, these things are made out of real leather. Personally, leather is one of our favorite materials for soft toe work boots because it is strong, durable, it looks nice, and is waterproof too. The Red Wing Men’s Iron Ranger Boots are built to last for years and years to come. Moreover, the Nitrile cork outer sole which the Red Wing Men’s Iron Ranger Boots are made with is another big bonus. This cork sole is very durable and long lasting. It won’t shred on you and come apart after just a few days, that is for sure. Moreover, the cork used for the outer soles is very flexible, it has good traction, and it protects from slips and falls quite well. It is also beneficial because it does not conduct electricity. We do like the fact that these Red Wing Men’s Iron Ranger Boots are made in the USA, they are handcrafted, and they are full double stitched. In other words, as far as soft toe work boots go, these things are about as rugged as can be. One thing that needs to be mentioned here is that the Red Wing Men’s Iron Ranger Boot are fairly comfortable, but they don’t come with any special insoles, midsoles, or any kind of special padding. They are comfortable for work boots, but they definitely are not made for running marathons. That being said, as far as work boots go, the Red Wing Men’s Iron Ranger Boots are actually quite lightweight. 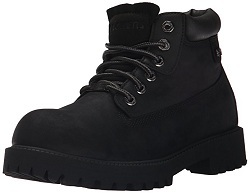 On a side note, while these things do not come with a steel toe, they do have a double leather toe cap for a little bit of added protection, which is good for worksites that are a little hazardous. The toe area is also made extra big for a bit of added room so you can wear thick work socks inside of them. This is another good pair of soft toe work boots to go with. For one, the Thorogood American Heritage Boot is also made with real leather. As we have said before, we love real leather. It looks really nice, especially with the nice design that these boots feature. They look professional, but they are more than ideal for most jobsites. The leather used here is very durable, it lasts for quite some time, and it won’t let any water through either. Now, the Thorogood American Heritage Boot may not be quite as durable as the option we reviewed above, but it does have a much higher comfort level. We do want to mention that this particular soft toe work boot is made in the USA, something that we can all appreciate. The Thorogood American Heritage Boot comes with a special removable ultimate shock absorption footbed on aPoron comfort cushion insole. This might sound like quite the mouthful, which it is, but this just means that these soft toe boots come with a whole lot of comfort. They are designed to provide you with a really soft working surface so your feet don’t hurt after just a couple of hours on the job. At the same time, they help to absorb a lot of shock and impact which you create with each step. 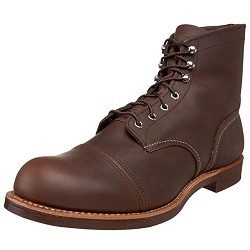 There is also the fact that the Thorogood American Heritage Boot is very supportive in terms of your arches. All in all, these boots help to keep your feet really comfortable for the duration of any work day. 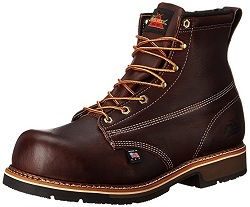 On a side note, you can get the Thorogood American Heritage Boot with a steel toe if you so choose. You do have that option. To make things even better, the Thorogood American Heritage Boot comes with a nice fiberglass shank to keep it in the best shape and in prime condition for a long time to come. At the same time, this shank also helps provide a lot of foot support. Moreover, these boots feature a nice Polyurethane MAXwear Wedge sole. For one, these soles are very durable and meant to withstand a heck of a lot of wear and tear. Also, the soles have good traction and are slip resistant, which is great for many slippery jobsites. Perhaps the best part about the outer sole is that is designed to be non-conductive and protect you from electric shocks. The Ever Boots Soft Toe Work Boots are yet another nice option to go with when it comes to work boots that do not feature steel toe caps. One of the big differences here is that these particular work boots, unlike the others that we have looked at, feature a special mesh lining on the inside for warmth and comfort. These boots are meant for colder conditions, as the mesh lining will help keep your feet warm. The Ever Boots Soft Toe Work Boots run a little bigger than you average boot, which is ideal because it means that you can fit your thick work socks into them for added warmth and comfort. The Ever Boots Soft Toe Work Boots are made out of real Nubuck leather, yet another thing that we really like. As we have said before, when it comes to work boots, there is just nothing better than leather, especially Nubuck leather. Not only is this stuff very durable, waterproof, and really good looking, but also flexible and comfortable. These boots are well known for the feature that they are flexible, they move with the feet, and they do not require a long break-in period. They are comfortable right from the get go. There are other factors here which help a lot with comfort. For one, the Ever Boots Soft Toe Work Boots come with a steel shank in the mid foot. This steel shank helps to support the arches and it keeps your feet in an anatomically correct position for comfort. Moreover, this steel shank also helps to protect against nails and other sharp objects penetrating the sole. In terms of comfort, the Ever Boots Soft Toe Work Boots also feature a comfort cushion insole. In other words, they do a fairly good job at providing you with a well-cushioned walking surface and at absorbing impact too. The Ever Boots Soft Toe Work Boots come with a nice slip resistant rubber outsole. The rubber used here is extremely durable and long lasting. Also, the rubber helps to make these boots non-conductive so you don’t electrocute yourself on the jobsite. Furthermore, the outsoles here are made to provide you with maximum grip and traction, even on slippery, wet, and oily surfaces. For easy wearing, they come with speedy hooks and back loops too. This final option on our list might be the last one, but it certainly holds its own against the competition. Just like all of the other boots we have looked at, these things are made of real leather. This means that they are very durable and long lasting. They will be able to stand up to a whole lot of wear and tear. At the same time, being made of leather, combined with factory sealed seams, makes the Timberland PRO Men’s Direct Attach Six-Inch Soft-Toe Boot totally waterproof. The Timberland PRO Men’s Direct Attach Six-Inch Soft-Toe Boot also comes with a nylon shock diffusion plate in the foot bed for optimal support. Your arches won’t hurt in these things, not one bit. At the same time, this foot plate also has anti-shock capabilities, so you won’t get electrocuted from the bottom up. These things also come with an interior anti-microbial lining which helps stop odors, it controls moisture, and it helps make things a little more comfortable too. The padded top collar definitely helps with the whole comfort factor too. The Timberland PRO Men’s Direct Attach Six-Inch Soft-Toe Boot are specially made to help absorb the shock which is created with each step, while also providing you with a soft walking surface. The rubber outsoles on these boots are also designed to be very long lasting, to be non-conductive, and to provide you with superior traction on a variety of surfaces too. Are you a working man, or maybe somebody who is about to start their first day on the construction site? If so, you need the right kind of foot protection for the job. You don’t want your feet being crushed by heavy falling objects. That could end your career. Safety boots are required on many workplaces, so you may as well get the best ones your money can buy. Composite toe work boots tend to be our favorite to go with. So, what are composite toe work boots and what are some of the best ones out there right now? What is a Composite Toe Work Boot? Composite toe work boots are a special kind of work boot designed to keep your toes and feet safe from many different forms of damage. Unlike steel toe cap boots, which use steel for protection, and alloy toe cap boots which use titanium or aluminum, composite toe work boots use a composite material that is non-conductive. This material can be some kind of plastic, hard rubber, carbon, Kevlar, and a couple of other things too. Now, all of these materials, when treated the right way, can be just as strong as steel toe or alloy toe boots. There is no question about that. They offer your toes with the same level of protection as steel toe boots. However, the big difference here is that composite toe work boots are non-conductive. This means that they do not conduct electricity due to not containing a conductive metal, therefore greatly reducing the chances of electrocution on the jobsite due to loose wires or electrified water. On a side note, composite toe work boots tend to be a bit lighter in weight than steel toe boots. Let’s just take a quick look at what we think are the two best composite toe work boots on the market today, which is true for several different reasons. The Carhartt Composite Toe Boot is by far our favorite option on the market right now. It’s a very protective, comfortable, convenient, and good looking work boot that is ideal for pretty much any jobsite out there. For one, they come with that classic composite toe cap, which is about as strong and lightweight as any toe cap can be. It protects from fall damage while also not weighing your foot down too much. At the same time, the fact that it is made of a composite material means that it won’t conduct electricity, thus reducing the chances of you being zapped on the job. The Carhartt Composite Toe Boot actually features a really wide toe box, which is nice because it means that your toes have some wiggle room. Also, this means that you can wear those thick and comfortable work socks inside of them too. All in all, these boots are actually made to be very comfortable. They feature a dual density EVA footbed, Strobel comfort cushioning, a supportive mid-foot shank, and Rugged Flex technology too. In essence, these features have many different comfort related benefits. They all help to provide you with a really soft walking surface, to provide multi-directional support (especially from the bottom to support your arches), to absorb as much impact from each step as possible, and to make these boots very flexible. When it comes to composite toe work boots, we think that the Carhartt Composite Toe Boots are probably the most comfortable ones on the market right now. Besides that, the Carhartt Composite Toe Boot also comes with a flexible rubber outsole. This outsole is very rugged, abrasion resistant, oil and slip resistant, and non-conductive too. In other words, it helps add to the safety factor a whole lot, not to mention that the outsole is very flexible, thus comfortable too. We rally cannot forget to mention how the Carhartt Composite Toe Boot is made of real leather, a very durable, easy to maintain, and good looking material. This particular composite toe work boot is a pretty interesting option to go with. The Bates Men’s Ultra-Lites 8 Inches Tactical Sport Side-Zip Boot features a side zipper and laces so you can easily put them on, plus this helps to make them more secure and supportive too. The fact that they are high-tops means that they do a lot in terms of ankle support. In terms of comfort, these things come with a removable comfort cushion insole. This helps to provide a really soft walking surface, as well as to absorb a lot of step impact too. These composite toe work boots have a really nice composite toe that helps protect against damage to your feet. It is very strong, plus being made out of composite materials means that this boot is non-conductive. It is a good option if you are going to be working around live wires. 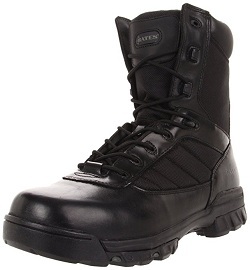 The Bates Men’s Ultra-Lites 8 Inches Tactical Sport Side-Zip Boot is made out of both leather and fabric. The leather helps make these shoes very tough and durable, while the fabric helps keep them lightweight and breathable too. They are breathable, but they also help keep you warm in the cold months. We also like the Bates Men’s Ultra-Lites 8 Inches Tactical Sport Side-Zip Boot because they come with a really nice rubber outsole. The outsole is non-conductive, slip resistant, and it is very durable too. These boots feature a moisture wicking interior lining, which helps keep your feet dry, odor free, and about as comfortable as can be. Bates is also considered as the an excellent tactical boot. Work boots are essential when it comes to many jobsites. Whether you are a carpenter, demolition expert, metal worker, or anything else of the sort, you need the right kind of protection for your feet. You don’t want your toes and feet being crushed by something just because you were not wearing the right kind of protection. So, what is an alloy toe cap and what are some of the best alloy toe work boots out there right now? What is an Alloy Toe Cap? So you probably know what a steel toe boot is. In case you don’t a steel toe boot, or steel toe cap boot, is a work boot that features a piece of steel in the front. This protects the toes and the front of the foot from being damaged by falling items on the job. Well, alloy toe caps are very similar to this, at least in theory. However, instead of using steel, these shoes use a metal alloy. Alloy toe caps are usually made of either aluminum or titanium. These come with a couple of big advantages over steel toe boots. For one, alloy toe caps like aluminum and titanium weigh much less than their steel counterparts. They can make at least a few hundred grams of difference no doubt. 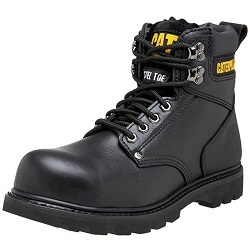 Alloy toe cap boots are much lighter and more comfortable to wear than the steel toe variety. At the same time, both aluminum and titanium, when put into work boots, tend to be much stronger and more resistant to denting, cracking, and crushing than steel is. 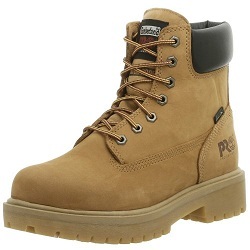 Therefore, alloy toe cap boots are both lighter and offer better protection than the steel toe counterpart. The only thing to keep in mind here is that alloy toe caps tend to be more expensive. We just want to take a quick look at 2 alloy toe caps which make for really nice work boots for a variety of reasons. Let’s get right to it. If you need a nice alloy toe cap work boot, the Timberland PROTitan Safety-Toe Work Boot makes for a nice option to keep in mind. For one, the toe in this boot features an alloy cap that is sure to protect your toes and the front of your feet from falling debris. This particular toe cap is about as strong as you could possibly hope for, making it ideal for even the most hazardous of workplaces. The fact that these boots use alloy instead of steel means that they are very lightweight, much lighter than any steel toe boot out there right now. Speaking of safety, the Timberland PROTitan Safety-Toe Work Boot comes with a high quality abrasion, slip, and oil resistant outsole. It is specially designed to keep you from slipping and falling on the jobsite, even when oil is involved, not to mention that it is quite durable too. It is not going to come apart anytime soon. The Timberland PROTitan Safety-Toe Work Boot comes with many features to help keep you comfortable all day long. For one, they come with Powerfit Comfort System. This is designed so that this boot provides much support where it is needed, but is also flexible in all of the right places. Therefore, this boot moves with your foot instead of against it, plus it has support in all of the right areas. This boot features a reduced break in time thanks to its cement construction, which is always nice. The interior of the Timberland PROTitan Safety-Toe Work Boot features an anti-microbial mesh lining to keep your feet from stinking and sweating too much. Finally, these things are made out of real full grain leather. For one, the leather makes these boots extremely durable, longlasting, and flexible. Moreover, being made of real leather also makes these boots waterproof, not to mention very good looking too. The Thorogood American Heritage Safety Toe Boot is another prime choice to go with in terms of safety toe boots. These particular boots feature a composite alloy toe. For one, this toe protection is superior to most others, especially in terms of impact and fall damage resistance. At the same time, the toe cap on these boots is much lighter than other like steel toe boots. It offers both comfort and protection at the same time. 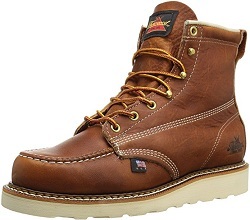 The Thorogood American Heritage Safety Toe Boot is made in the USA, plus it is made with real leather. Both of these features help to ensure that this boot is about as durable as can be. The leather is very resistant to pretty much all kinds of damage, it is waterproof, it looks nice, and with the right care, it will last for many years to come. To allow you to fit into these boots with your work socks, they come with an extra wide toe box. This boot features a synthetic sole which is oil and slip resistant. The synthetics use for the outsole are quite strong and feature a high level of abrasion resistance, not to mention that they offer great traction on many surfaces. The interior of the Thorogood American Heritage Safety Toe Boot features a fiberglass shank and a nice support system. In other words, these boots do a good job at supporting your arches and your feet in general. They do provide a fairly soft walking platform, as well as the ability to absorb a lot of impact from each step you take. The memory foam really excels at this job.